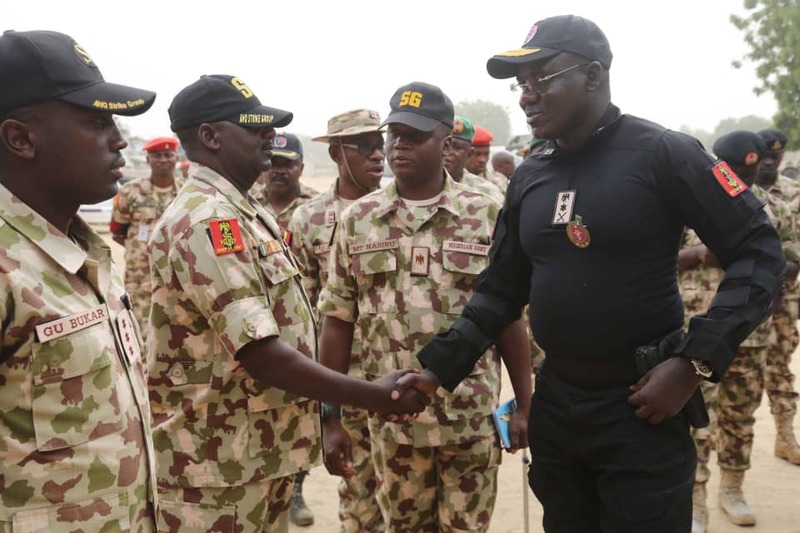 Buratai said the movement became necessary to enable the army, which is at the forefront of counterinsurgency operations, end terrorism in the shortest possible time. The Chief of Army Staff (COAS), Lieutenant-General Tukur Buratai, has approved deployment of top Army officers, with the ranks of Major Generals and Brigadier Generals to the North East. They would help the army prosecute the insurgency war in the region. The movement followed directives by President Muhammadu Buhari, to Buratai, to move to the North East and remain in the theatre of war until the security situation improves. Buratai said the officers should be prepared to move at the shortest possible time. The army chief made declaration at the decoration ceremony of newly-promoted senior officers to the ranks of Brigadier Generals and Major Generals in Abuja, yesterday, where he urged their wives to take good care of the homefront as they have been doing over the years. He said: “Some of you that have been promoted and decorated today (yesterday) are only waiting for today and by tomorrow (today), I expect you to pick your bags and start heading towards the North East. General Buratai, while congratulating the newly-promoted senior officers, noted that even though the number would have been more, shortage of vacancies made it inevitable for the authorities to promote only the desired number and added that the promotion was done purely on merit. “The military secretary has never witnessed this type of promotion because it was strictly on merit; right from day one, there was no any influence outside. “Your promotion today is a process but, above all, it had received the blessings of the president and outcome of the Nigerian Army Council,” he told the officers. Meanwhile, the Minister of Defence, Mansur Dan-Ali, has asked the Saudi Arabian Government to promote ideal Islamic doctrine and teachings to counter increasing extremism and terrorism across the world. Dan-Ali, in a remark at the flag-off of relief materials to Internally Displaced Persons (IDPs) by the Kingdom of Saudi Arabia at a camp for displaced Boko Haram victims in Maiduguri, Borno’s capital, yesterday, said Saudi is better positioned to give more understanding to Islamic knowledge and teachings in the world. The minister expressed happiness over the relationship between Saudi Arabia and Nigeria, describing it as very cordial. He also thanked the Saudi government for accepting to give humanitarian assistance to the victims of insurgency in the North East. Representative of King Salman Humanitarian Centre; the official Saudi relief agency, Nasir Al-Subai said the relief included food items for 840,000 IDPs in the North East out of which 70, 000 would go to Borno, the epicentre of the insurgency. He commended the National Emergency Management Agency and Borno State Government for facilitating the arrival of the food items from Saudi Arabia.